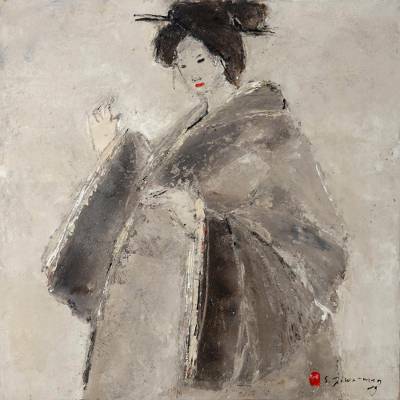 Wearing a traditional robe, an elegant Japanese woman makes for quite a sight in this original painting by Balinese artist Wayan Suarjiwatman. He works primarily with tones of beige, black, and brown, inspired by themes of calmness and meditation. In a display of innovative techniques, he realizes his subject's hair and dress with creative strokes of the palette knife, resulting in this striking composition.